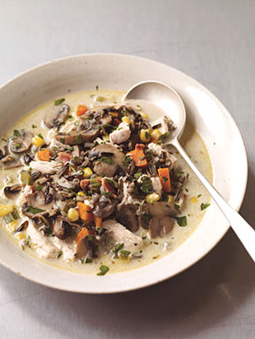 Turkey & Wild Rice Soup - A recipe from Savor California, the online showcase for extraordinary gourmet foods and beverages from California. Photo by Tina Rupp Photos. Bring water, rice, and salt to boil in medium saucepan. Reduce heat to low, cover, and simmer until rice is tender but still firm to bite, 45 to 60 minutes (time will vary depending on variety of rice). Drain; set aside. Heat oil in heavy large pot over medium heat. Add pancetta and cook until browned, stirring often, about 8 minutes. Using slotted spoon, transfer pancetta to paper towels to drain. Add mushrooms to pot and cook until beginning to brown, about 8 minutes. Transfer to medium bowl. Add butter to same pot. Add carrots and celery. Cover; cook until vegetables begin to soften, stirring often, about 5 minutes. Add shallots; stir until soft, about 2 minutes. Sprinkle flour over the vegetables in the pot and stir 1 minute. Return mushrooms to pot. Mix in stock and rosemary; bring to boil, stirring occasionally. Reduce heat to medium-low, partially cover, and simmer 15 minutes. Add rice, pancetta, turkey meat, and corn to soup. Simmer to blend flavors, about 10 minutes. Stir in cream. Season to taste with salt and pepper. To do ahead: Can be made 3 days ahead. Cool slightly. Chill uncovered until cool. Cover and keep chilled. Rewarm over medium heat before serving.